The West Highland Way is one of Scotland’s most iconic and well-travelled routes. 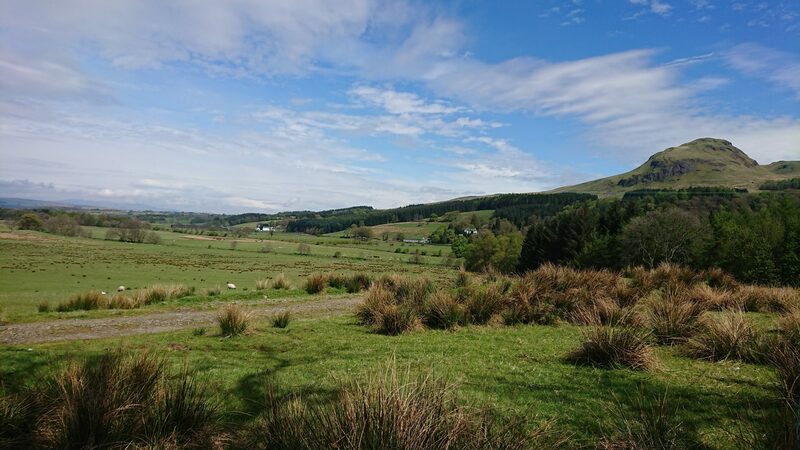 A total of 96 miles from Milngavie to Fort William, journeying from the city, through the Campsie Hills and into the rugged Mountains that are the Scottish Highlands! You are immersed in culture, history and stunning geographical features along the way. 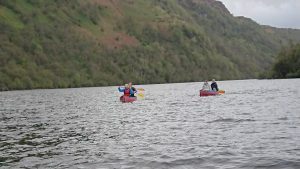 The traditional way to complete this route is by walking, I discovered a company, Active Outdoor Pursuits, that provide an amazing and very unique way of completing this route; walking, biking canoeing and sea kayaking! 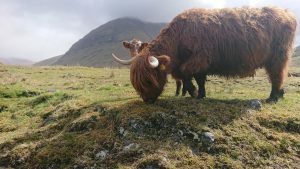 This is my story from start to finish of the West Highland Way Adventure – it is one of the best trips I have experienced! Being a solo traveller, I am used to meeting new people journeying along the way. Having received all my pre trip information and itinerary I was packed and ready to meet my fellow travellers in the sunny town of Milngavie. Our guides for the trip were Josh & Emy, with trip support provided by Rory and James; the support was on point for this trip! Our luggage being transferred between each accommodation base meaning we only needed a day bag; luxury! We began our WHW adventure on mountain bike, I am not the most experienced biker, but this did not matter, the trails were suitable for all the group. We meandered our way out of Milngavie past the towns and into the countryside with vast open spaces of greenery, lochs and forest areas. I even got to tick off a bucket list item mid-way into the day – a picture with a highland coo! One of the reasons I chose this adventure trip was the added element of experience true Scotland, by this I mean fully embracing the Scottish heritage and culture – what better way to start than a whisky tour on the first day! 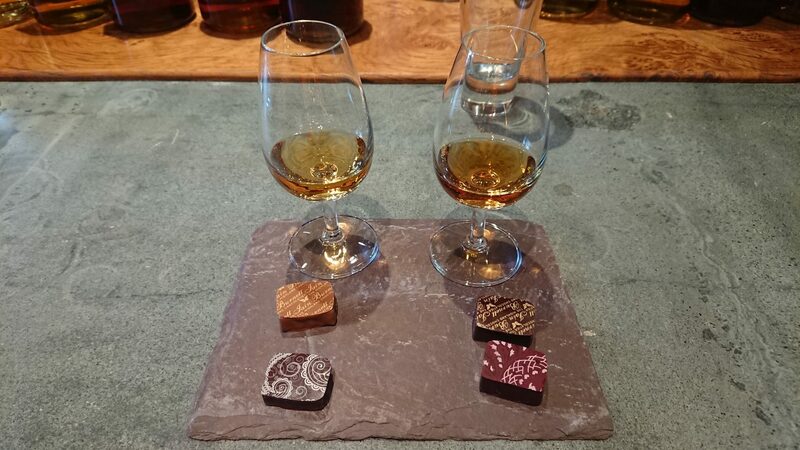 We stopped at the Glengoyne distillery and had our own private tour complete with chocolate tasting (including in the price of the trip). The guides at the distillery are very informative and the sampling of the whisky married with the chocolate made the experience even better. With a bottle of Glengoyne’s finest 18 year old purchased it was time to head back onto the trails and continue our journey. The landscape again forever changing as we left the picturesque village of Drymen and headed towards Balmaha where our route follows the shore line of the famous Loch Lomond! We took the high road and we took the low road! 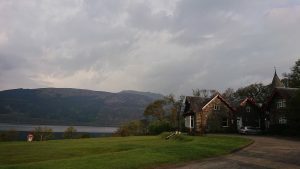 The views across the Loch, you could see for miles! It was beautiful! We continued up the eastern shoreline stopping at various points for photos and to hear historic facts and interesting stories about previous settlements and mythical passed down tales of feuds between Scottish clans. The trip is a mixture of camping and hostelling, tonight we were booked in at Rowardennan Lodge, on the banks of Loch Lomond. The support team had everything sorted of us arriving, cup of tea and shortbread – 5* service! The rooms were comfortable and the lodge really welcoming, friendly and clean. We got to mix with other travellers completing the WHW and exchange stories from todays adventure! For dinner we headed to a local restaurant, where I tasted another whisky and had haggis for the first time! The guides are fantastic and very knowledgeable answering all the groups questions about Scotland that we were throwing at them! Convincing the Aussie couple that Haggis was a real animal provided endless entertainment. A few drinks outside by the Loch had us see in the end to day one. T oday we hit the water! 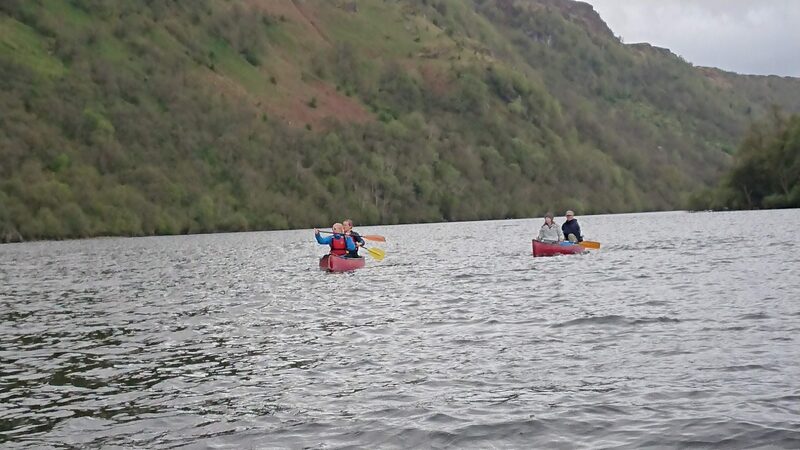 We had a intro to canoeing brief and a practice paddle near the banks before we set off in tandem northwards up Loch Lomond, our destination being up yonder at Inverarnan. Canoeing the WHW was never something I thought about when I initially searched for a company to book a trip with, but it is recommended! We paddled out to some of the small islands on the Loch and got to see the remains of old forts and hear more about the clans of Scotland. This particular area is home to the stories of Rob Roy, a noted highland outlaw, some could refer to him as a Scottish Robin Hood and now is famously known throughout Scottish folklore. The shoreline we paddled close to has views and access up to a cave Rob Roy used as a hide out amongst the times he rustled cattle. It is very remote and well hidden, nowadays it is only noticeable by the unfortunate large lettering word CAVE on the stone. It was interesting to hear the folklore and myths behind Rob Roy and his outlaw antics, also to hear that the cave was used by Robert the Bruce all the way back to 13th century as he hid from the English. Reaching the end of the Loch before heading down the river channel I took a glance back from the way we came. A landscape holding so much history, secrets and beauty. The river section is very tame, there aren’t any rapids which is great and it is a lovely scenic journey that ends right at our campsite for tonight; Beinglas Farm Campsite. Greeted by tea and shortbread – I could get used to this! The campsite has great facilities, warm showers (free of charge), toilets, shop, on site bar & restaurant, outside seating – it has all you need and more for a campsite, much better than what I had originally thought. There is the option to have a chalet for the night here but I felt mixing it up with camping gave more of an adventure element to the trip. The support team had already set up our tents which was a bonus as my arms feeling the effects of a days paddling, not something I am too used to. Dinner tonight I was glad to hear was at the famous Drovers Inn! I had previously read about the inn on a must visit guide when doing the WHW. Its is a very rustic and unique place, very Scottish! Walking in to Scottish music playing in the background, the walls floor to ceiling covered with photos and memorabilia all having their own tale of historic Scotland. Some of the stories we had heard during the day from Josh & Emy, fulfilling my confidence in knowing our guides have a proper and vast knowledge of Scottish history and not just making it up. 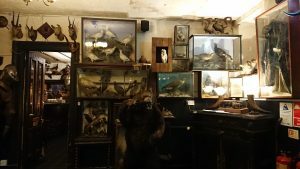 It was a very pleasant evening had at the Drovers Inn – I recommend this as a must visit place to eat! A comfortable night’s sleep was had, and I awoke ready for another day. The walking boots making their appearance along with the waterproofs! It was not heavy rain and it did pass over after the morning. Nothing could have dampened our spirits! Our guides were very good and there was not an non smiling face all day! There are many people doing the WHW, some in other organised tour groups, groups of friends and solo travellers, it is nice to see a familiar face that you had met on day 1 again on day 3 as we walk the same route, sharing the same experience but in a different and unique pathway. We stopped off at the Falls of Falloch, a natural beauty spot with a big water fall! Perfect spot to take a dip if you like wild swimming! A bit chilly for me so I opted out of this but it did not stop a few of our group who headed straight in without a second invite! The landscape becomes more dramatic as we walked north past Crianlarich, taking in the views of more Munro’s; Ben More, Stob Binnein and Cruach Ardrain. Pronunciation was never my strong point, but I gave it my best shot in a very put on Scottish accent. We unearthed more stories and myths as we approached St Fillan’s Priory. The holy pools of St Fillan’s, natural deep pool, was used for healing people who had illnesses and questionable mental stability; having to swim to the bottom of the pool, pick up stones and resurface to place the stones on the top of two cairns (now not visible). They were then taken back to the church and tied to the altar. If by morning the individual had broken free then a cure was said to be imminent, if not the process was repeated. It is really interesting to learn about this as if I had been walking this route solo, I probably would have just walked past what I thought was just a small pool of water! It was hostel night tonight for accommodation, a lovely family run bunkhouse; By the Way in Tyndrum. The rooms again, really nice, cosy, comfortable beds, warm showers and free wi-fi. I was rather glad of the hostel for tonight as the heavens opened just as we headed for dinner at a restaurant, our lovely support team drove us the 10 minute (walk) so we didn’t get soaked! Entertainment each night was more than we could have asked, our guides and support team stayed up with us chatting, telling us stories and playing card games. We became a really close friendship group and a competitive one at that when it came to learning and playing a game called Spoons – it involved cards and spoons. Half way through the trip! Time flies, day 4 we had a mix of journeying today, starting off on the bikes and finishing in Glencoe by foot. I was excited! Our campsite was at Glencoe Mountain, I had googled this before coming on the trip and the view towards one of the most photographed mountains; Buachaille Etive Mor, was going to be in full sight of our tents! Sundown and sunrise in Glencoe – amazing! The biking was on fairly easy tracks, there is some uphill and some downhill with one tricky section where most of us opted to walk the bikes but for those who have some experience on mountain bikes and a bit of confidence then it is a great small section of rocky downhill track! Our guides showing us how it was done – making it look easy! A couple of our group gave it a good shot, but I was happy to go on two feet than the two pedals for that section! We passed by many people who we had met the previous day as we headed to Bridge of Orchy, a marking point for the central highlands as we make our journey to the upper highlands of Fort William! We were met by the support team and had a snack, changed over into the walking boots and made haste over to Loch Tulla before heading into the remote hills. The views we got today, the gods were shinning on us! Blue skies! We could see for miles; the mountains and scenery was incredible! I have said this numerous of times already in this blog post but really, I was in awe. My pictures do not do this trip justice – you really have to come experience it for yourself! Descending down into Glencoe the valley opened up and you can see the mighty mountain that is Buachaille Etive Mor– the gateway to the West Highlands! Just as it was on day 2 out tents were set up and we were met with tea, coffee and snacks. The campsite again had everything you need; warm showers, a drying room, toilets, on site shop and free wi-fi. Tonight, we headed down Glencoe, the lovely support team driving us in, on the WHW route you don’t get to see much of Glencoe, so we were all really appreciative that our guides took us for dinner at the iconic and world famous climbers bar; The Clachaig, and we did a bit of sightseeing and stop offs to take photos of the 3 sisters of Glencoe and another stunning waterfall! The Clachaig is again on the must visit places for eating out if you can get to it! The food is fantastic, well priced and there was live music for entertainment! Having only been with the group for 4 days it felt like we had been friends for years! Returning to camp the sky was clear and you can make out the star constellations above the mountains, Scotland you just keep on giving! Day 5; Walking and Sea Kayaking to the stunning Kinlochleven! The boots remain on the feet for the first half of day 5! Set to walk from Glencoe, over the Devils Staircase and drop down into Kinlochleven before switching to sea kayaks for the remaining afternoon! I’ve gone on about the scenery so much but the views from the summit of the Devils Staircase were more than I could have imagined! The walk itself up to the top of the pass was on a path, it was relatively steep, but we took it at our own pace and stopped for breaks. We were told tales of the Jacobite rising and the massacre of Glencoe – not the most pleasant of stories but an important part of the history of Glencoe. The views from the summit cairn swept across towards Ben Nevis, the Grey Corries and Loch Rannoch, all places and summit peaks pointed out by our guides who had walked, climbed and paddled all over these places! What an amazing lifestyle and job they have I thought to myself! As we descend down into Kinlochleven I really began to think about how the land provides so much enjoyment for people and the access code that we were told about here in Scotland allows for people to walk, bike, climb and paddle pretty much anywhere. Leave no trace, respect the land and it will be here for many years & centuries more for others to enjoy. I was looking forward to getting into he sea kayak as the changeover point approached! I had sea kayaked before and loved it! We had a full safety brief and intro to how to paddle the boat which was a good refresher before we paddled off around to the campsite for tonight! Paddling out of Kinlochleven with the Pap of Glencoe to our side was pretty surreal, being surrounded by big mountains overshadowing Loch Leven as we made our way forwards! The wind was in our favour, so the paddle was very pleasant! We received some waves from the shoreline as we passed a couple of wild campers as we paddled into Invercoe, our campsite for the night! Once again hats off to our support team, meeting us at the beach which was right next to camp to help us with our kit and boats. The tea was on and snacks handed out! All tents were pitched, and the campsite had good facilities with toilets, hot showers, small on site shop and wi-fi. Time for a freshen up and a decision for dinner, there were a couple of choices, but the decision was unanimous, we wanted to go back to The Clachaig Inn as we enjoyed it so much the previous night! I awoke to the sun shining on the tent side, a decent night sleep was needed as today was a full day of paddling as we journey into outdoor capital of Scotland, Fort William. The weather was perfect for the last day, the water reflected the landscape on either side, it was like glass! A smooth paddle for the rest of the day was just what I hoped for! We were met by our support team for lunch on the banks of Loch Linnhe where we were told to keep an eye out for seals in the afternoon! An appearance they did make as we paddle a small rocky island there were an abundance of seals! It was amazing, as we paddled past a few started to swim along behind us following us for a good couple hundred of meters. A moment that will stick with me forever, and a highlight of my trip! As we neared Fort William Ben Nevis, UKs biggest mountain, was on the horizon line to our right, another spectacular view that was made all the better with the blue skies and sunshine! The journey was coming to an end as we came ashore in Fort William and walked as a group up to the official end point of the West Highland Way. It was quite an emotional moment for everyone, our 6 day journey had come to an end. We had a celebratory drink at one of the local bars in Fort William and had a good long chat about our trip! I did not expect this trip to impact on me as much as it has, we bonded as a group so quickly and our guides and support team were fantastic. This was certainly a trip of a life time for me and the best way to complete the West Highland Way. To experience the best of Scotland, have an adventurous time and make the most of your days here I highly recommend you book on to this trip. The 6 day trip combines sea kayaking, walking, mountain biking and canoeing as you complete the iconic West Highland Way. Everything is taken care of; accommodation, luggage transfers, shuttles, dinner reservations and the guides and support team are fantastic, everything runs so smoothly. The trip is filled with culture, history and knowledge on geographical features. You can really tell the whole guide and support team are passionate about the outdoors. Accommodation was ideal for the trip. A mixture of hostel and camping, all the facilities at each were great, better than expected. The trip was worth the money and is one trip I will be recommending to fellow travellers looking to visit Scotland. Thank you to Josh, Emy, Rory & James for an amazing 6 days in Scotland. 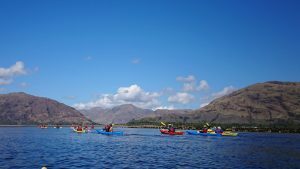 You can book this trip online at www.activeoutdoorpursuits.com in their adventure holidays section. 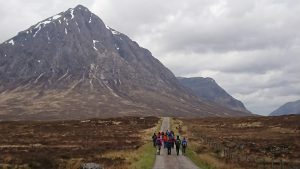 If you are looking to explore more of Scotland then Active do run a 10 day journey with one days rest combining the West Highland Way and then on to the Great Glen Way finishing up in Inverness.